In this game you will have to make words by dragging a line over letters. 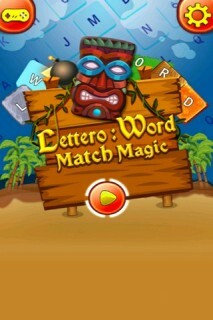 This is a magical puzzle game as there are some letters of which you can make two or more words. For example past is a word and if we rearrange it, spat is another what we can make of those four letters. So lets begin this race of making words from letters and at the same time let others know your efficiency of making words. Make words simply by dragging your finger in correct sequence over the letters. 3. Global leadership score card for sharing your score .